Mexico’s drug cartels are making full use of cyberspace to mount a campaign of intimidation targeting the country’s journalists and society, says exiled Mexican journalist Luis Horacio Nájera. 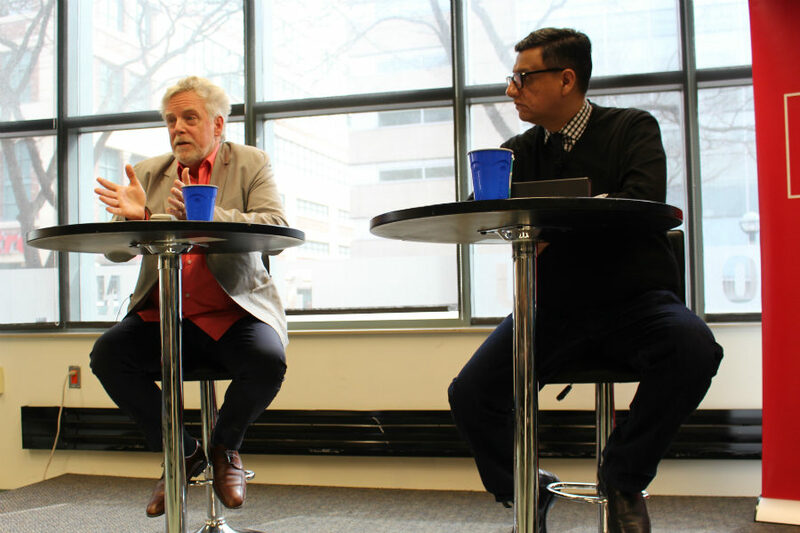 Since he fled Mexico in 2008, the drug cartels’ presence on social media has expanded and they now broadcast torture, decapitations and killings on blogs like Blog Del Narco, Nájera said during a March 9 presentation at the Ryerson School of Journalism. In 2015, news magazine Proceso’s photojournalist Rubén Espinosa received threats in Veracruz and fled to Mexico City for safety, where he was subsequently assassinated. His colleague, Proceso crime reporter Regina Martinez Pérez, had been found dead in her Veracruz home in 2012. No one knows who killed them, said James Cullingham, a documentary filmmaker and journalism professor at Seneca College, who appeared on the panel with Nájera. Former president Felipe Calderón launched Mexico’s war on drug cartels in December 2006. Since then, at least 80,000 people have died in organized crime-related incidents according to estimates in a 2015 report released by the Congressional Research Service. Just last week, Armando Arrieta Granados, the editorial director of the Veracruz newspaper La Opinión, was shot and remains in serious condition, according to the Committee to Protect Journalists. A few days earlier on March 23, Miroslava Breach Velducea, a correspondent for the national newspaper La Jornada, was killed as she was leaving her home in Chihuahua. Nájera wrote in a 2010 report released by the Committee to Protect Journalists that a reliable source informed him that his name was on an organized crime hit list because of his reporting on the Juárez drug wars. Cullingham said many major media organizations in Mexico no longer use bylines in efforts to protect their journalists. Other news organizations have stopped covering crime altogether and “are saying ‘we’ve just walked away from the story. We can’t have our reporters killed regularly,’” he said. Journalists and investigators, Nájera said, are no longer the only ones being targeted by the cartels. The presentation by Nájera and Cullingham was co-sponsored by Ryerson’s Centre for Free Expression and the Ryerson Journalism Research Centre.